Immunotherapy – treating a disease by inducing, enhancing, or suppressing an immune response – remains one of the biggest hopes in terms of potentially finding a breast cancer cure. And yet, it also remains an incredibly challenging discipline. What works for one type of cancer may not for another. Why is that? What lessons can researchers take from successful cases – melanoma, lung or other cancers – and apply to breast cancer? And where, exactly, are researchers in finding an immunology answer for breast cancer? To find out, Chris Riback spoke with one the nation’s leading researchers in the field, Dr. Jedd Wolchok. Dr. Wolchok is Chief of the Melanoma and Immunotherapeutics Service at Memorial Sloan Kettering Cancer Center. A BCRF Investigator since 2011 and currently supported in part by the Play for P.I.N.K Award, he has helped establish the center as a leader in the discovery and treatment of cancers with novel immunotherapies. He has been at the forefront of cancer immunotherapy, as an active clinician scientist exploring innovative strategies in laboratory models and as a principal investigator in numerous pivotal clinical trials. He’s also proficient with the tuba – didn’t see that one coming. Immunotherapy, treating a disease by inducing, enhancing or suppressing an immune response, remains one of the biggest hopes in terms of potentially finding a breast cancer cure, and yet it also remains an incredibly challenging discipline. What works for one type of cancer may not for another. Why is that? What lessons can researchers take from successful cases, melanoma, lung or other cancers, and apply to breast cancer? And where exactly are researchers in finding an immunology answer for breast cancer? To find out, I spoke with one of the nation's leading researchers in the field, Dr. Jedd Wolchock. Dr. Wolchock is chief of the melanoma and immunotherapeutics service at Memorial Sloan Kettering Cancer Center, a BCRF investigator since 2001, he's helped establish the center as a leader in the discovery and treatment of cancers with novel immunotherapies. He's been at the forefront of cancer immunotherapy as an active clinician scientist exploring innovative strategies and laboratory models, and as a principal investigator in numerous pivotal clinical trials. He's also, as I learned, proficient with the tuba. I confess, I didn't see that one coming. Before my conversation with Dr. Wolchock though, one last item, an ask from me to you. I hope you like these investigating breast cancer conversations, and if so I'd appreciate if you'd take a moment, go to iTunes and if you're so moved, leave a five-star review. The ratings really matter. They go a long way to helping other people find the podcast. Thank you for considering my request. Okay, that's it. Here's my conversation with Dr. Jedd Wolchock. Dr. Wolchock, thanks for joining me. I appreciate your time. Dr. Wolchock: Thank you for having me Chris. I appreciate the opportunity to chat with you. Chris Riback: So immunotherapy, it remains one of the biggest hopes in terms of potentially finding a breast cancer cure, and at the same time an incredibly challenging discipline. Let's start with the big picture. Why is immunotherapy so difficult to perfect, particularly in breast cancer? Dr. Wolchock: That's a great question. I think immunotherapy has a very long history dating back over 100 years, attempts to try to mobilize our body's immune cells to fight cancer like it would an infection. I would say for the first 80% of that hundred years, we didn't make a whole lot of progress clinically. We did learn a whole lot at the basic science level, so I think that's important to acknowledge that it really took a dedicated time and investment of resources in some very important basic science investigations to understand what regulates our immune system, both in the healthy state and in people with cancer, to develop new therapies. In the past 10 years or so, we've become aware that there are some medicines which can treat some cancers quite effectively using the immune system. These are what have been termed checkpoint blocking antibodies. The most well-known of which are antibodies that block a molecule called PD1 or PDL1, and I'll refer to them interchangeably. For all intents and purposes, these checkpoint blocking antibodies essentially cut the molecular brakes that keep our immune system under control. And if a patient has already had an immune reaction to their tumor, that is if their immune cells have already seen the tumor or recognized it but the immune system is being held back by these brakes from adequately killing the tumor, these medicines can be very effective in mediating very durable regressions. This type of response has been seen in a variety of different cancers, including melanoma, kidney cancer, bladder cancer, lung cancer, some kinds of lymphomas, head and neck cancer, some gastrointestinal malignancies, and importantly, for this conversation, there is some evidence that these medicines have activity in triple negative breast cancer. Chris Riback: Talk to me about the differences among the cancers. As I was researching for this conversation, one of the things that stood out to me was it appears that it may be straightforward, surely isn't the right word, but immunotherapy may be more straightforward with a lung cancer or a melanoma. Again, I know straightforward isn't the proper word. It's complicated in all cases, but certainly more complicated, it appears, in breast cancer. Why the differences within the cancers? Dr. Wolchock: It's a really important question and one that we have not totally figured out yet. I can tell you sort of what we know already, and one is really that the cancers in which this type of approach tends to work are those in which there's more baseline genetic damage, more mutations in the genes. The reason why that may be important to the immune system is because the immune system will recognize these altered or mutated proteins from these genes as being foreign in the same way that the immune system recognizes things that are derived from bacteria and viruses as being foreign as opposed to our own normal cells. So one rule that has been very popular in study in the past five or 10 years has been looking at the degree of genetic damage and relating that to outcomes for immunotherapy. Now, melanoma is amongst the most mutated or genetically damaged of all cancers because it arises in many people as a result of sun exposure, and the organ at risk, the skin, is exposed to the sun many hours and many days. So there's an accumulation of genetic damage. Only a small amount of that genetic damage is actually responsible for driving so that the malignancy ... So there's [inaudible 00:06:52] to this background, or passenger gene mutation. But in a breast cancer, the triple negative subtype is more genetically damaged, therefore attract more inflammation at baseline and is amenable to this kind of treatment. In lung cancer, we see again the same message that those cancers that arise in people who have had a lot of tobacco exposure, and therefore a lot of genetic damage, are more likely to respond. I should say that it's better not to smoke at all and not get the cancer to begin with than to get a cancer as a result of the genetic damage from tobacco use. Chris Riback: Yeah, it's almost, again to a layperson such as myself, it almost seems counterintuitive. So the more foreign or the more damaged that genetic or protein makeup is, the more possible it is for the immunotherapy at this point, and I guess perhaps this is the working theory, for it to be effective. One often thinks, "Well, gosh. The more problematic something is, the harder it would be to fix." How should I think about that complexity? Dr. Wolchock: Well, I think that it's a very logical conclusion to come to. What we believe is that the genetic complexity that we are measuring is not necessarily all related to pathways that lead to the malignancy. Some of it may be silent genetic damage that's not contributing to the aggressiveness of the tumor, but rather just what's been termed bystander or passenger genetic damage, but it is a very good question. We have more recently learned that there are other routes to this end of getting the immune system interested at baseline in something so that once we cut the brakes, if you will, the immune system is better able to see the cancer. What seems to matter is whether there are immune cells in the tumor, inside the tumor at baseline. We think that one way of getting those immune cells into the tumor at baseline, meaning before we treat the patient, is because of genetic damage. Another is that if there are perhaps just a few mutations that cause a change in the biology of the tumor that allow more immune cells in, and our group here recently had up a paper in a very rare subtype of ovary cancer showing that even though there's very little genetic damage, there's a lot of immune interest in the tumor because of where that genetic damage is, what pathways that became abnormal and how that affected the ability of the immune system to enter the tumor. That was a story that made it to the Science Times about a week or two ago. Chris Riback: That's what I was just going to ask you about. It wasn't immediately clear to me ... I saw that you were quoted in that piece, an incredible piece of these four women from four different places around the world who I guess got themselves into an immunology program that doctors said would not work for them, and luckily it appears it did work for them. So is that part of the surprise ... What did you learn or what happened, I guess, that surprised you that was I guess a very fortunate result for these women and maybe, and then too, I guess, is it something that you think can potentially be extrapolated to other cancers, what you learned in this one particular case? Dr. Wolchock: Yeah. It's a really, really excellent point. What we learned is that having many genetic mutations is not the only way that a tumor becomes interesting to the immune system, that there can be just a few genetic errors that change the biology in the tumor in a very powerful way that let immune cells in, and it also really alerted us that we have not figured out all of the rules that govern whether or not immunotherapy works. We have some general principles but they're not absolute, and that's why when patients like those women with this rare what's been termed small cell hypercalcemic type of ovary cancer got access to PD1 blocking medicines, largely through compassionate use, not through formal clinical trial per se, we learn a lot from studying individual people and unexpected responses, so I think that that's a very important lesson for us. Chris Riback: It's got to be so fulfilling in two ways that immediately jump to mind. One, the obvious one, you've helped save, well extend or save, these women's lives, and that's got to be the most fulfilling part of what you do, but also taking that heroic part out of it, you're working in a field, you've been working in it for 20, 30 years, however long it's been, and you still must find daily regular surprises. These things that you, these new discoveries. You're busy sleuthing, and every once in a while these new discoveries pop up perhaps in places that you didn't expect them, and that's got to just keep it incredibly fresh, I guess. Dr. Wolchock: Indeed, and I think you hit some very important points there. One is that this is an incredibly fulfilling job that I have to try to help people dealing with very human, very difficult problems and to try to as quickly as possible find answers. It's often very humbling, but it's a great privilege to try to serve fellow people who are struggling. I think that it's also very rewarding to see the work of the past, help some people, but every week that I'm in clinic I also see people for whom these currently available immunotherapies are not yet the right answer for, and that is firm, really impetus, for working even harder doing more science, both in the laboratory and in the clinic, to develop even more effective approaches that use the immune system alone or in combination with other treatments to try and control cancer. Chris Riback: Yes. That is the unfortunate news. I'm sure you would take this the best way possible. We all hope that at some point you don't have a job. Dr. Wolchock: Oh, I say that to my patients all the time, that I would be very happy to be unemployed. Chris Riback: We'll find something else. There's Uber, Uber's got a great program and we can intro- ... We'd love to be able to introduce that to you at some point. Chris Riback: So where are we and where are you in terms of breast cancer immunology? I understand that there have been a phase I clinical trial test to test the vaccine for safety and efficacy in patients with HER2-positive metastatic breast cancer. Where is that? Is that ... Am I up-to-date on that? Is that trial still underway? Chris Riback: What's the status? Dr. Wolchock: Right. So that's our first project that BCRF funded was a novel form of vaccine to try to initiate a baseline immune response in women who have HER2-positive breast cancer. The trial has been completed. We're in the process of measuring the immune reactions in the laboratory, and we think that approaches like that are what are going to be needed to add to these other immunotherapy medicines that have recently been evaluated in many diseases as a multi-component treatment for this disease. We have also done some work in the laboratory looking at the ability of medicines that block a pathway called the PI-3K gamma pathway in breast cancer models to limit some suppressive immune cells, and actually that is a very important lesson that not all immune cells are good or helpful. Some of them are there to dampen the immune response, and so we not only have to accelerate the good immune cells, but we have to quiet down the bad ones. I'm actually working with several breast cancer clinicians around that particular topic. 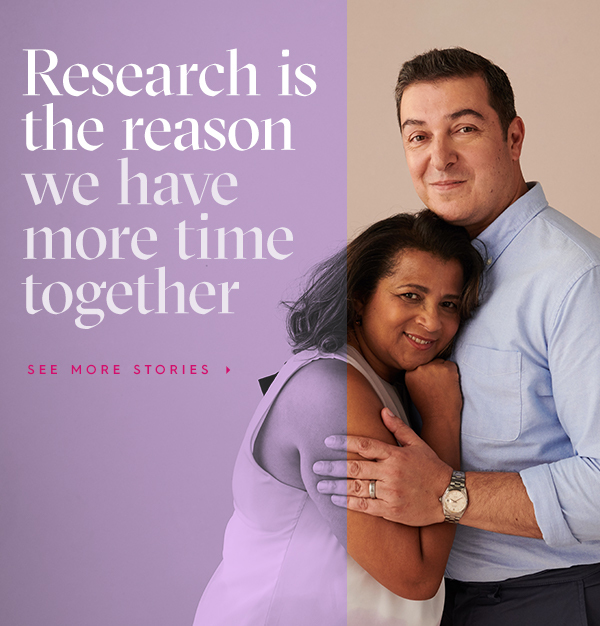 I think in breast cancer, we have some clues and leads of what needs to be done, and we are actively engaged with the support of BCRF in finding more powerful approaches. Chris Riback: How did you transition into breast cancer? Was it always one of the ones that ... Obviously, I know melanoma has been hugely significant for you, and perhaps lung cancer as well, and you talked about the ovarian cancer. How and when did you transition into breast cancer, looking at that as well? Dr. Wolchock: Actually, I started with this first vaccine trial where the initial roots of that in the laboratory date back about 20 years, and the reason was quite straightforward at the time that we had developed a novel way to try to vaccinate against certain cancers that seemed to be very potent in the laboratory. We were looking at different targets on cancer cells, different types of cancer cells, to vaccinate against. Given the success, early success at the time, but now certainly more profound success now, of drugs, of antibodies that block HER2, or now drugs that block HER2, it really appeared as if HER2 were a very promising target to try to vaccinate against, and so we began to apply lessons that we learned studying melanoma to breast cancer. As this vaccine program evolved, I became more interested in understanding more about what the immunologic needs were in the area of breast cancer. I think this is a philosophy that has taken hold across our institution, across many institutions, that we no longer, at least at the scientific and clinical investigation level, should be studying one disease. We need to be studying mechanisms, underlying diseases, because those mechanisms could be widely applicable across diseases. I think that's extremely important, and it really leverages the work for even higher impact. Chris Riback: I can't tell you, I hear that so often. It's one of the most fascinating aspects of these conversations. I hear that from the researchers and the scientists very, very frequently, that it's the cross discipline action across various cancers and trying to consider what is it that worked in this one area and is there some part of that, that we can help make work in a different area, that is key to so much research it seems and every once in a while the breakthroughs. Related question. What about combining immunotherapy with radiation? I was reading a little bit about that. What do you feel is possible there? Dr. Wolchock: I think that that's an area of very current investigation. We know that radiation can have a profound effect on tumor cells in terms of limiting their growth. It can also cause both favorable as well as perhaps some unfavorable changes to immune cells within the tumor, so we're working, along with many other groups, to try to understand that better and optimize ways to use radiation along with immunotherapy. We also are very interested in understanding what the best way to use immunotherapy along with chemotherapy is. We know that chemotherapy plays a pivotal role in outcomes in breast cancer, and we don't want to necessarily walk away from that. We think that we need to expand upon that clinical activity in a thoughtful and systematic way, so timing becomes important. When do you introduce immunotherapy in someone who's receiving chemotherapy? How is it best to do that? Is it best to do it before the chemotherapy, before ... because we know that chemotherapy can have a temporary immune suppressing effect, but we also know that after chemotherapy, as the immune system is reconstituting itself or recovering, that is a time of great immune activity. So we actually think that right after chemotherapy might be a very opportune moment to introduce an immunotherapy. Chris Riback: Before I let you go, tell me about you. Was it always science as you were growing up? I see you spent just a ... your undergrad years at Princeton, but most of the rest of your time was at NYU, so I'm assuming that perhaps you're New York born and raised, but was it always science for you? Was there ever a time where you thought you might become a playwright instead? Dr. Wolchock: I think it was clear to me once I started college that I was interested in science medicine, or as it turns out both. So I've kind of been on that narrow focus track for a while. Like many of my colleagues, I do have some outside interests. I'm a musician. I play tuba in an adult avocational wind ensemble. Dr. Wolchock: And very much enjoy that. Chris Riback: Wow. Okay, so then we don't need to worry about you. Go ahead, have this job go away please, and I'm sure you'd be very happy being a musician and traveling the world that way. Dr. Wolchock: Yes. Although I've said I think it may be easier to be a cancer researcher than it is actually to find a place as a professional tuba player. Those jobs don't open up very often. Chris Riback: No, they don't. And trying to get the luggage in the overhead in the plane, that can't be easy either. Dr. Wolchock: Oh no. Got that right. Chris Riback: Dr. Wolchock, thank you. Thank you for your time and for the work that you do. Dr. Wolchock: Well, thank you for the opportunity to talk and thanks to BCRF for the ongoing support, for the vision to have recognized immunotherapy as an answer for the future, and for all the enthusiasm beyond our work. Chris Riback: That was my conversation with Dr. Jedd Wolchock. My thanks to Dr. Wolchock for joining, and you for listening. To learn more about breast cancer research or to subscribe to our podcast, go to BCRF.org/podcasts.